Technically, we arrived in Baden-Baden at the end of a long day two. We checked into our hotel, found a lovely place to dine al fresco (with blankets to help keep us warm in the chilly May air) and enjoyed a relaxing night after a busy and interesting day. 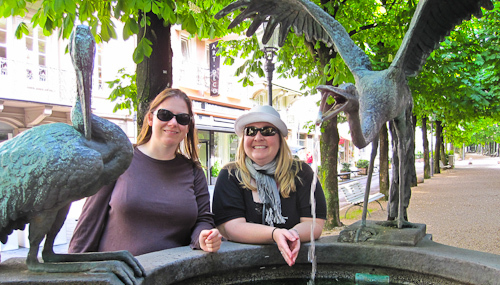 We retired early, intending to spend the day exploring the town and possibly a bit of the Black Forest south of town. 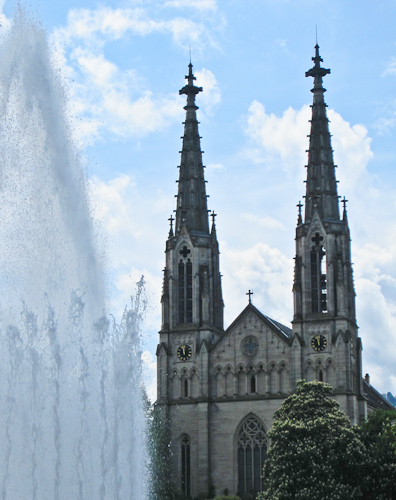 The BBB&B favorite guide Rick had a walk through Baden-Baden that hit all the major (and some of the minor) sights. The photoset will take you through the details, but I thought I would give you a preview of some of the lovely things. After we finished Rick’s walk, we decided we could use a short break and possibly a light refreshment. We found a lovely place near the river which seemed to be perfect – in the sun, with good beers and wines and a nice atmosphere. It wasn’t long, though, before some deep, dark and menacing clouds floated above. 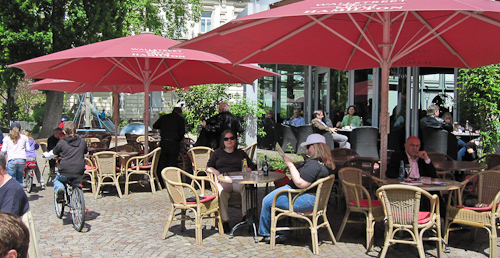 The Ladies of Baden-Baden had a decision to make: stay at our table under the umbrella or make a run for it through the gentle rain. As we were debating the decision, large drops of rain started to fall – in earnest. It was an outrageous downpour. Under our umbrella we were safe and dry, but had we tried to leave we would have been soaked through instantly. Jaime took a long look at the rain and declared it a “tantrum.” She was confident that the weather, much like a difficult two-year-old, was simply throwing a fit. She predicted a quick end to such terrible weather. Sharon and I had faith in her declaration and we decided to wait out the rain – with a second drink and a delicious lunch! Jaime was right. Within 20 minutes the rain had spent itself, much like an exhausted toddler. The clouds passed and we were again left with a sunny sky and a beautiful day. The only lingering down-side was our abuse of the word tantrum for the rest of the visit. But it wouldn’t be a road trip without a little tantrum, now would it? After our long repast, we finally ventured to the car. We headed into the Black Forest for a while, before turning towards Luxembourg. Will was happy to see us arrive safely home, with a plan to stay local for a few days. 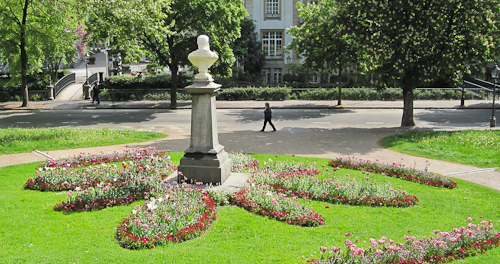 Next up: exploring Luxembourg! THANK YOU for finding the Contador/Schleck ad. That cracks me up every time I see it. I looked for it the other day, and couldn’t find it. I have been watching the tour for a while now, and I have never seen Andy eat 21 energy gels AND a whole fried chicken. Dave – You haven’t seen him eat a whole fried turkey because he does it back at the lair (the secret party pond). Didn’t you see the turkey fryer in the background?